We bloggers need to talk more about the mistakes in makeup application whilst highlighting right ways. 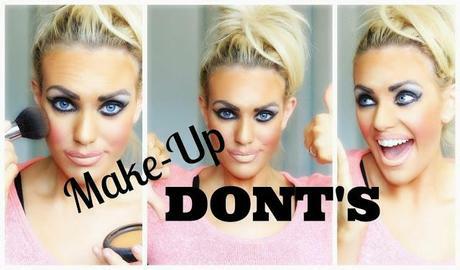 Makeup Don’t are of course what you should not do when you apply makeup. There are tons that are new with the creation of various makeup products but some are classic mistakes that people do still carry onto while they overdo a technique. As a makeup Artist, I always make sure to abide by the rules of makeup and avoiding the don’ts since I do makeup for Photography. 1 Matching your foundation to your neck: This is something quite common but what you need to focus is NOT to match your foundation to your face but your neck. A lot of us have the issue of the skin tone of our face being darker and so on so this is a rule of thumb. 2 Careful of Translucent powders: Powders that claim to be translucent aren’t particularly translucent especially within cheaper budget brands. Some might work well for fair skin tones but might give terrible white cast on darker skin tones. ELF HD translucent powder is one such powder that I have a bad time with for my medium NC42 skin tone. 3 Undertone of your foundation: If you have extreme yellow undertones I understand that the market doesn’t have much foundations to cater to you. If you choose the wrong undertone of foundation, it might look terribly off in flash photography making you look ashy. 4 Using all shimmer eye shadows in your eye look: Unless you’re going for an exotic Arabic look, you should avoid using all shimmer. Use a matte shade for your brow bone. 5 Using too much powder: The whole purpose of powder is to mattify your face, don’t overdo it expecting more coverage. If you feel like you have a cakey face, spray a mist of water all over your face to set it. 6 Dark Eyebrows: Dark eyebrows should be avoided even if you have the darkest hair. Use dark brown for your brows if you have dark brows.